Each year, the University of Kentucky welcomes new and returning students to campus with nine crammed-full days incorporating more than 350 activities and events. It's called K Week, and it has become a proud UK tradition in recent years. With a daily schedule that starts at the crack of dawn and continues well past sundown, it's possible for new students to spend every waking minute of K Week exploring the university. Some activities are geared toward new students, to help them get acquainted with their new home and the surrounding area. Others highlight the organizations, services, and resources available on campus, to help ensure a successful and enriching four years at UK. And some events are just for fun. In fact, K Week is so action-packed, it often seems to pass by in one blurry instant. However, the real story of K Week goes back a whole year. Behind the scenes, a cadre of university staff, student employees and volunteers have been working since last fall to ensure this year's K Week's success. "K Week planning for 2011 started the day that K Week 2010 ended," says Michelle Ashcraft, assistant director of New Student and Parent Programs. "We have our two K Crew coordinators, who help us plan for the whole year and then stay on with us for another month afterward.… It's literally a year-round project." Christie Baughman, a psychology senior from Atlanta, and Cameron Hamilton, a biology senior from Elizabethtown, are this year's K Crew coordinators. They provide leadership to K Crew, a group of 350 student leaders who are responsible for planning and carrying out K Week events, in conjunction with 218 K Week partners in departments across campus. A smaller group of administrative-level student leaders called the Super Crew helps to make sure everything comes off without a hitch. "It's a lot of phone calls and emails," Baughman says. "Working to make sure everyone and everything are where they're supposed to be at the right times." Information packets must be assembled and delivered to each of some 5,000 freshmen who will all be streaming onto campus for the first time, at the same time. A fleet of golf carts must be summoned to manage delivery of materials to sites all over campus. Tons — literally, tons — of free food will be served. Dozens of promotional giveaways will need to be arranged with local businesses. "The free stuff is really a great way to get students to get out there," Baughman says. "And it's awesome to get all the free stuff." And then there are the T-shirts: thousands upon thousands of free T-shirts. "If you're a freshman student you can definitely plan on building your UK wardrobe in your first week," Hamilton says. But K Week has a more important purpose, Ashcraft says, one that will hopefully make a positive impact on the lives of UK freshmen for years to come. "The most common thing that we hear from students every year is that they are really just concerned about making friends when they first come here," she said. "They're excited about classes and whatever their major is going to be and all the things they want to get involved in, but they are terrified about making that first friend here on campus…. We really try to focus on making sure they can make those friendships during those first few days before classes start." Baughman remembers her first week on campus, as a new student, in a new city, in a new state, and says she wants to give other freshmen the same kind of warm welcome she received. "I think, being an out-of-state student kind of made it a different experience for me," she said. "When I came here, I knew one person. She had already moved in, so she knew people by the time I got here. So, K Week was a really good experience for me — being able to meet new people. I really am looking forward to giving that kind of experience to new students." Hamilton describes himself as fortunate to have good mentors when he was a new student, and he views his role as a K Crew coordinator as a way of paying it forward. "I really liked K Week when I was going through it," he said. "It's something that I've been doing for a couple years now. I really like helping freshmen and being a mentor." 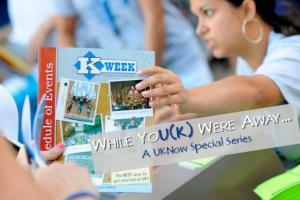 For a complete list of K Week events, visit www.uky.edu/KWeek or visit the Campus Calendar.